This is what we ate for dinner tonight and it’s so good, I just had to share a photo and point you over to Elise’s wonderful Beef Stroganoff recipe at Simply Recipes. I’ve also been meaning to tell you how much my husband and I have been enjoying whole wheat egg noodles, and this is the perfect excuse to do so! So far, the only brand I’ve tried is Ronzoni Healthy Harvest, but they are so good I haven’t wanted to try any other kind. While this Beef Stroganoff recipe is far from healthy, at least we’re getting some extra fiber and protein from the egg noodles (twisted logic, I know). Each serving of the pasta contains 6 grams of fiber and 8 grams of protein. Not bad, huh? Of course there are probably healthier ways to enjoy whole wheat egg noodles, but lately I just can’t stop craving comfort foods! If you’re in the same boat, you can at least make small changes (like using whole grain pasta) to increase the nutritional value of these not-so-healthy meals. I think I’ll use these whole wheat egg noodles the next time I make Tuna Noodle Casserole, too! They really are good. Now back to the Beef Stroganoff. I followed Elise’s recipe to a T and it is absolutely delicious! The fresh tarragon and fresh-grated nutmeg sets this Stroganoff apart from anything I’ve had before. And I suggest using a nice cut of beef just like she suggests. I found some tenderloin in the freezer (how on earth did I forget about that?) and it turned this into a special occasion-worthy dish. What’s the special occasion? Well, is it wrong to still be celebrating my birthday? I’m kidding, I grudgingly gave up the birthday celebrating early Monday morning when Justin woke me up asking if I could help him get out the door on time by making him some coffee. Oh well, the party can’t last forever! But tonight, with this meal, it kind of feels like a party all over again. I hope you get a chance to try the Stroganoff at least once this season, it’s the perfect thing to warm you up on these cool winter nights! 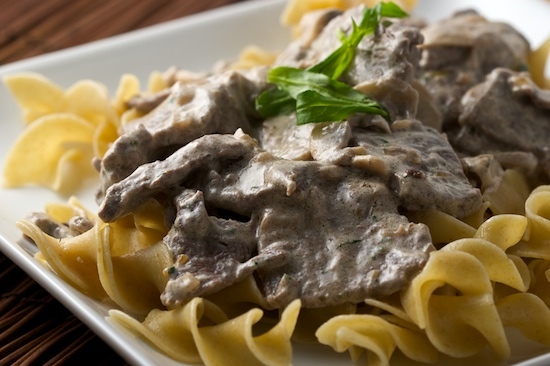 Get it here: Beef Stroganoff Recipe at Simply Recipes. I’ll be back with my own recipes soon. Expect many more fattening recipes throughout December! I adore this recipe. It's become one of our regulars! Easy and so very, very tasty. That looks good. I need to try those whole wheat noodles. Yum! I love egg noodles and have never seen whole wheat ones, thanks for sharing that... wish I had them on the weekend when I was making my comfort food of tuna noodle casserole! What a great inspiration. I haven't had Beef Stroganoff in a long time. I would probably deglaze the pan with a couple of tablespoons of sherry or beef broth. And yes, the good cut of beef is a must!I'm making this tomorrow night, i'll let you know how it turns out! I can't tell you the last time I had this dish. I am off today baking away and promised to make the husband dinner, this is going to be it. Thanks for the inspiration! I always hated beef stroganoff as a kid but this looks great. My dad used to make beef stroganoff for us all the time growing up and it was so good. The pictrure of your dinner totally just took me back there again. Haha, no way! This is one of my favorite meals and I always get made fun of. But it's a classic! I love it over noodles or rice. Yum yum yum! I love stroganoff. We use fresh sage in ours, and it's delicious. I'm always on the lookout for a good whole wheat noodle. I'll have to give this one a try. Tried it. Absolutely delish. Only thing I did differently was add a a tablespoon of Sherry and two tablespoons of beef broth to deglaze the pan after sauteing the shallots and mushrooms. That adds a nice depth to the sauce. This looks like a great dish! I love when we're able to mix delicious and healthy in a single meal, i especially like the whole wheat noodles. Btw, the picture looks great, i'll have to try it! This looks wonderful. I actually stumbled across her recipe, too, so I think it's a keeper. Trying it this evening. Thank you for sharing!